A sleepy selfie on the early bus! 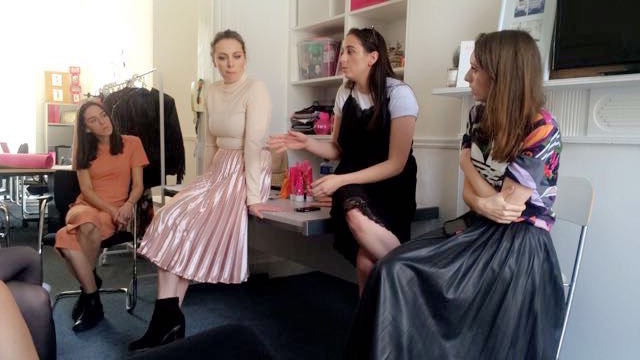 If you follow my social media pages you will know that I attended a course called ‘So you want to Work in Fashion?’ hosted by the fabulous McGinn sisters. Jennie, Sarah and Grace McGinn founded Opsh.com, the online shopping destination where the high street is brought straight to your finger tips, and their sister Lorna completes the foursome of #GirlBosses 🙋🏽 The day long course was designed to give an insight into the fashion industry through a combination of interactive and engaging workshops! I was ready to take lots of notes! 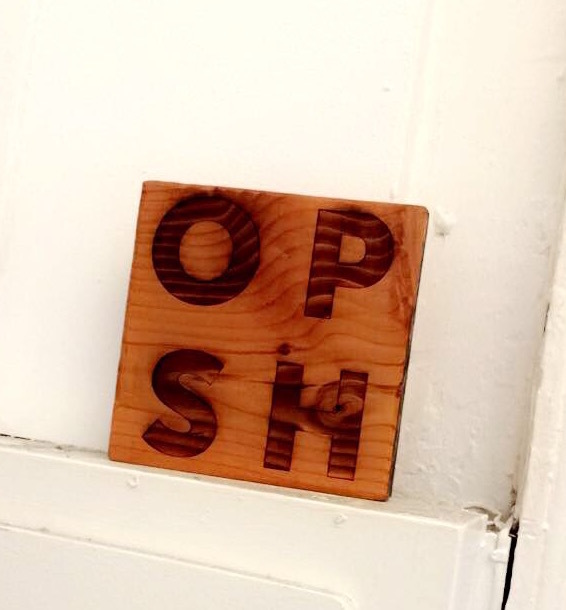 The day began with coffee and Kronuts, as ya do, in Opsh HQ, (which btw are the cutest offices I’ve ever been in 👌🏼) Once we were fuelled up, Jennie gave us the background to Opsh and the different career paths that her and her sisters took. There really is no straightforward, black and white way to break into the fashion industry and in part, that’s the real beauty of it – it’s meant to be colourful and the stories Jennie shared with us certainly were colourful! Then there were some icebreakers that involved us revealing our biggest fashion faux pas 🙀 Let’s just say, what happens in Opsh, stays in Opsh!! Jennie kicked off proceedings with an intro to Opsh! Lorna then got started on the Journalism workshop. Personally I think it’s really important to be able to write well if you work in fashion, whether or not your interest lies in fashion journalism or blogging. Even just today I had to put together the newsletter in work and of course, if I didn’t have an understanding of how to write appropriately for the audience that would be reading it, I wouldn’t have done a good job. It plays a huge part in advertising too and being able to just chat with customers. Lorna reminded us of how important it is to have good writing skills both online and offline so it’s great to be able to out together a short, snappy post for a website but equally as important to be able to write a full page article. Iterning is a great way to get the foot in the door if fashion journalism is where your passion lies but Lorna said that you do need to stand out and have that memorable, personal touch. Spend time generating different ideas, reading your favourite blogs and magazines and get inspired by them – reading will actually improve your writing! The interactive element of this workshop was really great actually and put us to work straight away. We were each asked to pick a card at random and this contained a topic that we had to research and write a 150 word article about in 10 minutes! My topic was Slip Shirts/Dresses and I was laughing to myself thinking of how similar this blog post that I had recently shared with you guys was! The second workshop focused on PR and Marketing with Sarah. Nowadays it’s more important than ever for brands to find their USP and play to their strengths because the market is saturated with similar businesses that are ‘trend’ driven, leading to a lot of repetition. I think that Opsh have done a really good job of this and Sarah gave us loads of examples of marketing campaigns, media drops and events that they’ve used in the past that were really distinctive and stood out! 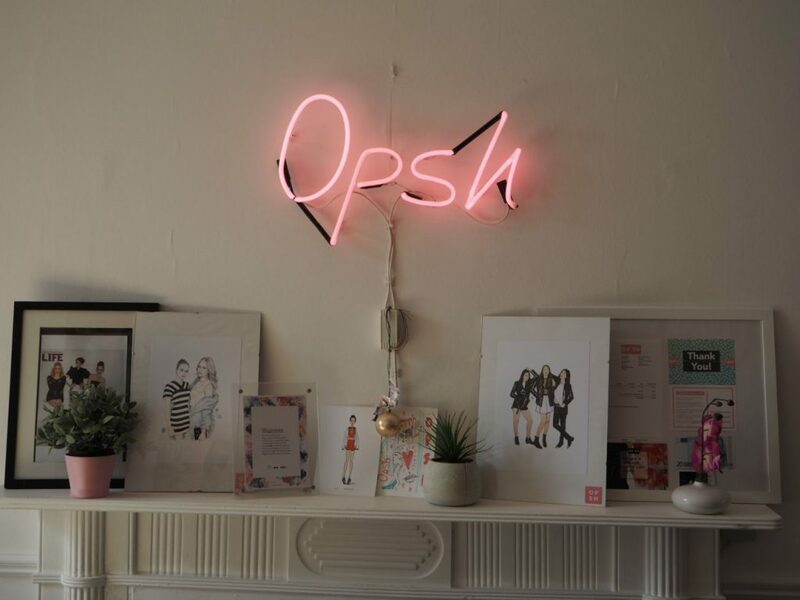 Opsh have found their voice as a brand that is for empowering women and #GirlBosses – they are about collaboration, not competition! I’m still dying over Sarah’s metallic skirt!! Sarah also touched on the not so glam side of marketing, when things go wrong (!!) and how to respond. It’s so important to keep the head, stay focused on what the end goal was originally and find a way around the bleep 😉 For the activity in the workshop, we were put in to groups and given a card at random again. This time it was a scenario for which we had to come up with an action plan for. Me & two other lovely gals put our heads together and brainstormed how we would promote the launch of a new retailer on Opsh.com. Considering all the elements that Sarah had just discussed, we put forward a strong focus on the online campaign, paired with an Xpose slot and exclusive discount code for Opsh shoppers! We then broke for lunch á la Apache Pizza – yaaaasss!! After lunch Grace delved into the world of Branding and Design. This was definitely the area that I was hoping to learn the most in as I felt my own skills were lacking, especially in design. I have great vision for how I want things to look but I sometimes find it hard to make it come to life. Creating a unique brand is what will make your business or blog stand out from the crowd. You have to know exactly what you’re about and allow this to be the base for things like your name, visual references and identity. Grace gave us so many good tips on handy platforms to use for editing and finding reference imagery so that was really helpful. The final workshop was with Jennie who spoke about Styling and Social Media. As we were running a little over time, she gave us the most important pointers surrounding social media. As a young group we probably all had a good grasp on the bones of social media and how influential it is, so in a way the timing worked out for the best as we learned the most important bits! The styling side of things was totally interactive and so much fun! We split up in to new groups and set up shots for both clothes and accessories with the products and props in the office. The creative juices were flowing and it was great to see how other people put their shots together too; you get to see things from a totally new perspective and some of the girls ideas were actually ingenious! You can see our fashion shot on Instagram, here. Overall, I thoroughly enjoyed the day and it was well worth the journey up from Wexford. The gals made us all feel so at ease and because there was a small group, it meant that the course was a really intimate and you felt comfortable in the environment. Sometimes I feel that when you’re sat in a sea of people and have so many other things going on in your mind, you don’t concentrate on actually getting the most out of the course and a lot of the information flies over your head. This was definitely not the case here as I took a lot from what the McGinn sisters had to share. This course was the first of many that they will run at Opsh and I would definitely recommend it to anyone that is maybe in secondary school or college or is in a career that isn’t really sitting right with them. If you’re interested in getting in to the fashion industry initially, this is the course for you as it gave an overview of a couple of different areas of the industry and because the girls all had such different routes in to it, they have a lot of different experiences to share with you. It’s the ultimate beginners guide to the fashion industry! If you have any questions about the course or how I got on, get in touch with me on Facebook, Instagram, Twitter or Snapchat.